Personalised rosettes are the perfect way to take a standard badge design and elevate it to the next level. Whilst badges are still a very popular addition to any party, you sometimes want to make one of them stand out a little more from the rest. For example if all the guests at a party are wearing badges, then it is a good idea to give the Bride, the Stag or Birthday Girl or Boy a rosette so that it is clear who should be the focus of attention. 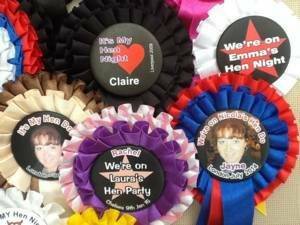 Our rosettes are designed on our standard badge designs and use a 58mm badge as the centre. This means that the centre can be printed in full colour, which means that a photograph can be placed there if required. We have placed several suggestions for the centres of the rosettes on the web page links below, so please feel free to browse and select the design that best suits your needs. 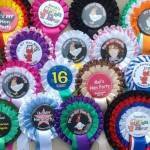 Of course any of the designs for your personalised rosettes can be modified with wording, colours, designs etc to suit your needs. The designs are there for you to choose if you want or to give you some ideas about what could be achieved. Our rosettes are all hand made by us and produced to order, so you can specify whatever combination of ribbon colours you require. You can co-ordinate your colours with any theme that you might be having for the night, or match club or society colours. Choose from single, double or triple tiered rosettes and if you require you can also arrange for custom printing on the tails of the rosettes. The number and colours of the tails are up to you. All our rosettes are produced with top quality ribbon which is box [pleated to give a full, quality-looking rosette. Don’t confuse our rosettes with some of the very cheap-looking rosettes that are commonly available. 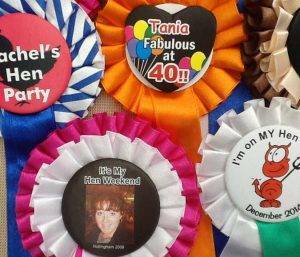 We can also produce other styles of rosettes. On the following pages you will see a selection of designs for hen nights. To personalise your design, just follow the instructions as they appear on the right hand side. For most badge and rosette designs you can add the names of your guests to your personalised badge design. To add guest names, please ensure the ‘guest names check box’ says ‘yes’ and a new text box will appear. Add the names, separate them by commas. If you do not require guest names then just leave the ‘Guest Name’ box as ‘no’.